This is part 2 of a 4-part series on the cultural impact of social media. Read part 1 here. Social Media platforms are designed for broadcasting and consuming content, but not for interacting with others. In this post, we’ll look at how this lack of interaction undermines meaningful relationships — whether they’re personal, professional, or romantic. People don’t interact on social media. Many people will argue against this, citing likes and shares or recently renewed connections with long-lost friends. But, despite our best intentions, the truth is most of us don’t use social media to interact. One theory, the 90:9:1 rule, claims that roughly 90 percent of social media users are “lurkers.” I myself fit into that category. We lurkers scroll through post after post — just looking, and seldom leaving any trace of our browsings. We rarely respond to what we see and almost never create a post ourselves. If it’s true that 90 percent of us fall into this category, then the vast majority of us do not really interact on social media. What, then, about the other ten percent? Facebook provides a good example, claiming to have 1.79 billion active users every month, with a total of 4.5 billion likes and 800 million comments made each day. If all this activity was spread evenly across the 10 percent of interacting users (which it’s not), the average would only be around 30 likes and comments per user on any given day. * This is especially worrying when we realize that most of these digital “interactions” aren’t actually interactions at all. Most of the actions on Facebook posts are likes. These are reactions to a post and are much closer to read receipts or an acknowledging head nod from across the street — neither of which constitute an interaction. There is no opportunity to respond to a like. The like button has made reacting to a post effortless, but has by default also made it harder to get a reciprocal reaction, making even the most basic two-way interaction unlikely. To use the like button is to take the path of least resistance — all it requires is a click on a simple thumbs-up symbol and we can move on. Even comments require more effort. Comments provide an opportunity to engage in a basic online conversation, but likes are a dead-end. With likes taken out of the equation, the average of 30 Facebook interactions per day for non-lurker users drops to 4.5 interactions. For the most part, comments and likes are reactions not interactions. An interaction is an exchange of information. For a comment to be an interaction, the original poster must respond to the comment — there must be two-way communication — for it to constitute a full interaction. As with likes, if we post a comment and have no way of knowing if someone saw it, then it’s unlikely we’re interacting with that person. Comments with more than one back and forth are so rare on any form of social media that the already low average of 4.5 daily interactions falls to practically zero. The average Facebook user has 338 friends and 15 percent of users have over 500. This is far more than Dunbar’s Number, which says we are capable of sustaining no more than 150 relationships. A simple click of a button adds a “friend,” and the number of forgotten friends in our social media network inevitably grows. Ask a friend what percentage of their own Facebook friends they actually know. Find people with whom they have zero or one mutual friend, and show them their profile picture, covering their name. Try not to gloat as you accept your drink. We want more and more friends to feel like we belong. Yet the more friends we have, the more diluted are our connections. The limited interactions we are having online are now spread so thin that we hardly ever use social media to interact with any of our friends. Without regular interactions, social media can only serve to deliver us updates about people we already know and act as a forum for digital small talk. At best, social media lets us maintain a handful of relationships — but it usually doesn’t improve them. One of social media’s biggest threats is that it changes habits in our behavior. Platforms like Facebook and Twitter are actually training us to consume more and interact less. Let’s not forget the fear, self-doubt, and vulnerability involved in this process. This is what is required to reply to something in our feed. With such a low return on investment, it is no wonder that there aren’t many comments on most posts. This consuming behavior is training us out of actually interacting with one another. Our growing bias toward consumption and away from interaction isn’t just making us terrible at digital conversations. It’s spreading to the real world, too. 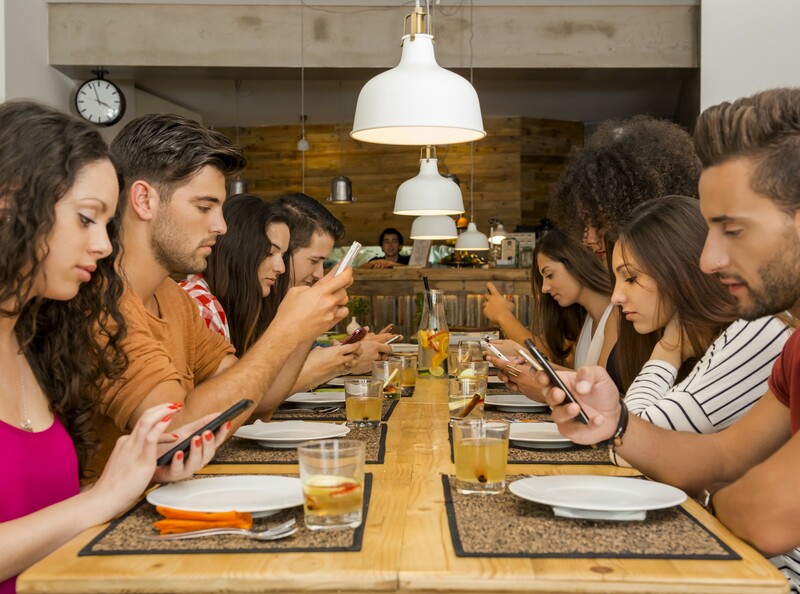 We have all either witnessed or partaken in dinners where everyone at the table is looking at their phone. This happens everywhere and is only getting worse. We are losing our ability to be present and have a conversation with the people who surround us. Our phones contain a curated feed of information. Consuming this information requires much less effort — and is much more entertaining — than the humans in front of us. In the end, it’s easier to consume than to interact. As long as social media trains us to consume more and interact less, our abilities to have meaningful conversations will decline. Meanwhile, a generation is being born into a world where consumption platforms are the primary way to stay connected. It’s more important than ever to be aware of how the structure of digital socializing impacts all of our relationships. In the third post of this series, we’ll look at social media’s effect on our communities — and how it’s destined to keep pushing us apart rather than bringing us closer together.